Mayor Rick Rogers, City Manager Joe Hannan, Community Development Director Doug Rux and Public Works Director Jay Harris all met with WestRock officials to discuss the property. Rux said the meeting was mostly just to communicate the master plan for the riverfront area the city is working on, as it includes the property the mill sits on. "We went through where we're at with the plans, (and were) trying to get some guidance from them about what their ideas are," Rux said. "We also talked to them about access to our water treatment plant." Hannan said most of the discussion centered on the city's riverfront master plan, which the city began updating in 2017. The goal of the plan is to look at what mix of uses, both residential and business, should be in the riverfront area; planning a walking, biking and automotive network to increase connectivity within the area and the city; and protect open space. Hannan said they presented the three WestRock officials with what they had and he said the officials indicated the city would hear back with the company's thoughts. He added that the city will then carry WestRock's response to the Riverfront Citizens Advisory Committee. "We assume their response to the master plan will be from decision makers," he said, adding that while there were "side conversations" that included the future of the shuttered mill site, the topic largely remained on the riverfront. "What we asked and what they agreed to was to respond to the master plan," Hannan said. Hannan said they met with three WestRock officials and toured the site – a person who works in real estate, a person who works in government affairs, and someone in management. Some of them had never seen the mill before, Hannan said. This comes just a few months after three of the state's highest elected officials called for renewed dialogue between the mill owners and stakeholders. In a letter to WestRock's CEO Steven Voorhees, Gov. Kate Brown and U.S. Reps. Suzanne Bonamici and Earl Blumenauer, all Democrats, expressed continued concerns about the mill, which closed in 2016 after the Atlanta-based company acquired it from SP Fiber Tech. The company intended to sell the mill and inked an $8.25 million contract with an Idaho-based scrap company to do just that on the condition the paper making machinery inside was destroyed. This alleged condition prompted Sen. Ron Wyden to write a letter to the U.S. Department of Justice and the Federal Trade Commission about the potential illegal action. WestRock also allegedly turned down a $15 million offer from a New York businessman who wanted to reopen the mill and use recycled paper to make pulp and paper for export. Rux said other items discussed included where railroad line crossing issues may occur, and rail access, as there are some issues with lines over private property. However, nothing concrete came as a result of the meeting, so the immediate future of the mill remains unchanged. "It was more like a lot of information sharing; this is the stuff we've got going on," Rux said. Rogers said there was a lot of discussion in the meeting and that he was grateful that WestRock officials traveled from Georgia. "WestRock wants to explore all their possibilities," Rogers said. "I think we can safely say we'd love to see something happen on the mill site." Rogers said the city and WestRock will have to continue discussions to figure out what may eventually happen to the mill site. "If nothing else we're grateful they came up from Atlanta," Rogers said. "It started the conversation; we can interpret that as a good sign. But again we'll just have to continue to work and continue to express our interests to the community. Hopefully, we can come to some place where the mill won't just be sitting there." Hannan also said just having the conversation was positive. "Anytime you're talking it's productive," he said. Harris said he was involved in the meeting because the city's water treatment facility is on the mill site and plant operations could impact the city facility. He also said there was some discussion of the riverfront plan, which looks at myriad uses for the area, including residential and commercial purposes. "It was good to get in touch with them and talk with them about what they do day to day and what we do day to day," Harris said. "It was good to coordinate with them." WestRock officials said earlier this summer they would be open to selling the mill to another mill operator rather than demolishing the equipment. However, two potential buyers were reportedly given the cold shoulder. There had been suspicious WestRock was simply biding its time while its bid to purchase Keystone Paper and Packing Co. was reviewed. 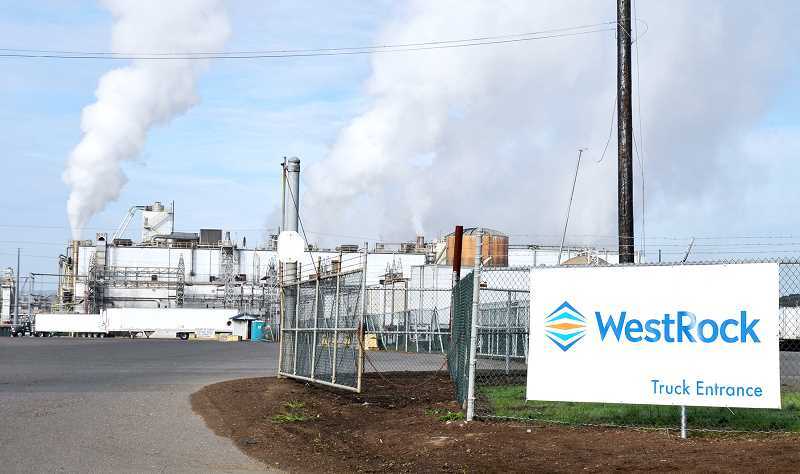 The AWPPW submitted a complaint this spring to the antitrust division of the U.S. Department of Justice, arguing that WestRock's then-pending sale of the Newberg mill to a scrapper indicated it wanted to reduce competition. Ultimately, Wyden wrote his letter about WestRock's behavior.